Since over 50 years Gentili’s companies are in hydraulic industry engaged. 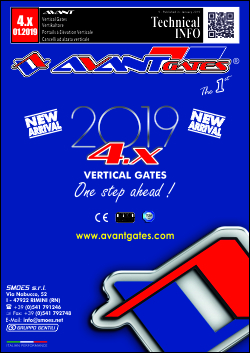 Recently this hydraulic path of research and development has found its height in the creation of the first and only certified vertical hydraulic pivot gate called AVANTGATES. Civil and industrial closings field applications revolution. INNOVATION, FLEXIBILITY, DESIGN and QUALITY let our client be sure that the outcome is the highest quality certified product which has no equal in the world closure market. Thanks to its versatility, Avantgates provides design studies, engineering, architecture and construction companies the opportunity to develop new projects without the constraints imposed by traditional locking systems, opening new horizons to the creativity of these professionals, often limited by absence of alternative solutions and valid up to their quality standards. Our team of highly skilled professionals and highly experienced, is able to follow the customer from design to proper installation of the final product, thus being able to provide a complete certification of the closure system. This is a very important feature, because improper installation and performed by unskilled personnel, completely invalidate the certification of the product. Experience, technology and above all passion are the real “engine” driving that 2 generations and almost half a century distinguish us. A wide range of automatic closures to meet the needs of any type of manufactured. The countless variants allow you to provide the right solution for the needs of condos, villas, large residential complexes, hotels and campgrounds. Versatility, compact size and highly intensive use, distinguish the vertically opening gates in the Industrial version. They are the ideal solution for industries, logistic centi, car parks, barracks, airports, customs, shopping centers, marinas, motorway access and waste collection areas. The only traffic barriers hydraulically operated up to 10 mt. of length. Power, reliability, durability and low maintenance, guarantee the product high durability. They can also be matched to the gates of the residential and industrial series, ensuring an integrated operating logic. We inform you that our company will be closed for Christmas holidays from December 22nd to January 6th inclusive. The normal activity will resume on Monday, January 7th. Happy holidays to all! 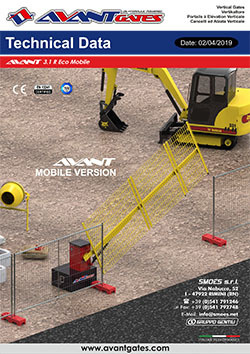 Learn the strengths and peculiarities of a vertical gate AVANT, compared to the traditional ones.